Most gastropubs are known for typical staple ‘pub grub’ dishes; however at the Canton Arms, things can get a little bit fancy. The menu here changes often and can be a little quirky so sometimes you won’t be able to just get your ‘steak and chips’ meal. 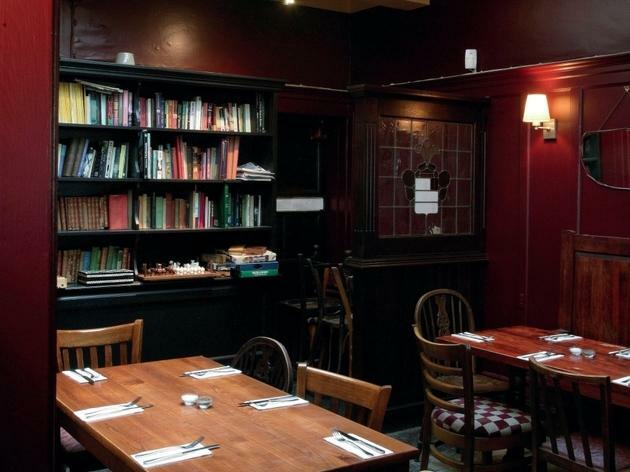 It would be nice to have a staple ‘go-to’ pub grub dish on the menu, but having said that, the food here has always been quite good. It’s also great to see that they also put on specials depending on the season. I’ve tried the roast grouse during ‘grouse season’ and they also had roast duck. It’s always nice to see something different on the menu; though the flavour may be a bit too gamey for some. The trout I’ve had here in the summer was light, juicy, and filling. The dessert here is also nothing to be sniffed at - the baked goods and pudding have always been satisfying for those with a sweet tooth. Altogether, a solid gastropub, but sometimes I think they try to do too much on the menu. Tip: it tends super busy on weekends, and they don’t take bookings unless you’re having an large event, so if you want a sunday roast, get in early. The same goes for getting a table outside in the summer. Try the toasties if you’re feeling a bit peckish - they are very good and they do a variety of flavours like haggis, black pudding and ham hock toasties; dripping with cheese, of course. Incredibly rude misogynistic staff. AVOID! My friends and I came here for a later lunch last Sunday. Though their "Sunday lunch" menu is limited (unless you want to go for one of their sharing meals like lamb for 2), the rest of the menu is packed with really delicious sounding delights which are all seasonal. I enjoyed the beef with roasties and kale which was served beautifully pink. There was no option to book but I arrived early and put our name down, and we were seated at the time we had wanted to be. I think if we had arrived to eat at 1 we would have struggled to get a table. The service is good though the barman is a little frosty. 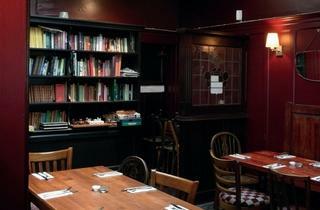 Dining is at the back of the room but at the front of the pub there is plenty of space to drink and read the papers. There is also a nice looking outdoor seating area for the nicer weather days. A small glass of the house wine is less than a fiver and main dishes stretch between the £12-18 mark which I don't think is too bad considering the quality. Love this pub but love the fine food in the inventive and friendly restaurant through the back even more. Great place to go for a chilled drinks with friends - really cosy and inviting atmosphere. Terrible value. A lamb roast was £16 for 2 slices of lamb, 2 roast potatoes (no joke) and a tablespoon of kale. For £16 there was no veg, no side of potatoes or even gravy. We couldn't beleive that when we asked the manager if it came with anything else and that we were disappoint with the 1.5hr wait and the tiny, low quality meal she said we should try the Toby Calvery! The food can be very heavy, nice presentation, fab well kept real ales. Down side to the pub...... barstaff think it is cool to throw bottles into bottle bin, the crashing noise can really kill atmosphere and create tension at a table. The toliets need serious attention. Pub windows are bare and could do with good curtains. What this pub needs is competition to motivate them into training the barstaff not to throw bottles into bottle bins, get some window dressings of curtains and pelmets, and do something with the smelly unkept toliets. Overpriced. Over-hyped. Over-cooked. Add to this a surly female waitress and disgusting male toilet. Bring back chicken-in-a-basket! Terrible service... Tasteless food. Don't believe the hype. Truly truly great. Just go and try for yourselves. A lovely old pub, in need of a touch of paint here and there but the atmosphere on the Sunday afternoon was relaxed, and the interior reminded me of a blend of traditional with gastronomic pub, but not in the clinical way that many chains seem to achieve. Service started well and the menu was concise and different, mainly in that the mainstay of a Sunday roast wasn't on offer. I started with the sardines, feeling the need for the healthy fish oils after one or two too many the previous evening. They looked the part, large and juicy but somewhat undercooked for my liking, perhaps deliberate but I enjoy sashimi and enjoy cooked fish but this was a synthesis of the two and I struggled to pull the raw fish from the bones and left half of each. I would have loved to try the roast chicken with ceasar salad but this was on the board for 2 and, at £26, probably a bit greedy for 1. I had the Porchetta, which was a lovely slice of rolled pork, three small roast potato's and salad. It was a nice dish but I'd have happily put away another slice and thought there'd be a little more for the price. I did see someone having the chicken and I'd have been better to have that for myself and to have skipped the starter. The skin was a little pale however and, from other postings, it seems that this aversion to cooking time is a trend. My colleague had the duck leg which was very nice with lentils but again could have spent another minute or two crisping the skin, getting rid of some of the fattier bits. It was busy by the time we were leaving so had to take the bill and card to the bar to pay as the staff seemed preoccupied with the table service. Overall the food was interesting and decent, I prefer some dishes a little more cooked, but others could disagree. It's a five minute walk from home so I'd return on occasion to see if we had a slight off day, but the Bear in Camberwell has always proved reliable so remains a better choice for me right now. really cosy pub, always full and allows pets which is great!!! havent tried the food yet, but am planning on it! !